Used by law enforcement officers throughout the world, the Glock is the most popular spring gun that we carry. 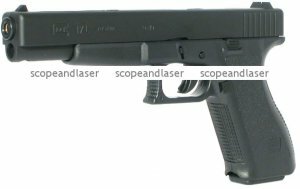 Very solidly built and packs enough punch to give a nasty welt, the Glock 17L is one of our favorite spring handguns. Very accurate. HG adds Hop-Up and a full size removable magazine. Finishing is top notch with authentic Glock markings.